In full disclosure, I am a former wedding photographer, and a very similar situation happened to me. At a wedding about 7 years ago, I noticed the DJ sent out one of his assistants with a camera. At first I let it go – I figured he was grabbing a few promo shots – no harm, no foul. As the night went on, things got MUCH worse. The DJ’s assistant starting asking me what settings to use and how to use his flash. Then, the mother of the groom came over and asked “Could you please ask your assistant to stop flashing everyone directly in the face?” I certainly didn’t tell him to do that, and I had to explain that he was NOT affiliated with me and was brought in by the DJ. I politely asked the DJ to stop and that I would be happy to provide him with images. He flat out ignored me. Then the images his assistant took started being shown on massive screens by the DJ both. The bride ran over, horrified, asking if those were our images. I had no choice but to ask the couple to intervene – they had to ask 3 times, and had to threaten to not pay him before his assistant stopped and he turned off the screens. The first argument that always arises is that the contract between a professional and the couple doesn’t extend to other wedding professionals. And this is correct; you cannot enforce terms and conditions on persons or companies who are not signing the contract. What can be enforced is the conditions that the couple agrees to when they sign. 1). Multiple photographers cause confusion with guests. When the DJs display these images, it can be damaging to the photographer’s reputation as the images often aren’t properly lit or well exposed. The guests are dancing, drinking and having a great time – they aren’t going to make the distinction between whose images are being shown. 2). Damage to photographer’s brand and reputation. The majority of other wedding pros who take photos (in addition to the paid photographer) are NOT typically experienced or trained photographers, and the resulting images reflect that. No photographer, who spends hours culling and editing their images, wants to have their company’s work confused with the images taken by the DJ or a hired hand. Many photographers count on, or at least hope for, sales from guests who attended the wedding. When DJs or other pros post images, they typically do it for free as a “gift” to the couple – this can negatively impact the photographer’s income. Photographers get upset because, for many, the majority of their business comes from word of mouth and meeting guests at weddings. If their company is negatively impacted by the actions of the DJ taking images, how could they ignore that? Their only recourse, because their contract is with the couple, is to take the issue to said couple for a resolution. No photographer wants to bother the couple with any kind of conflict, especially when it involves the other professional hired for their special day. 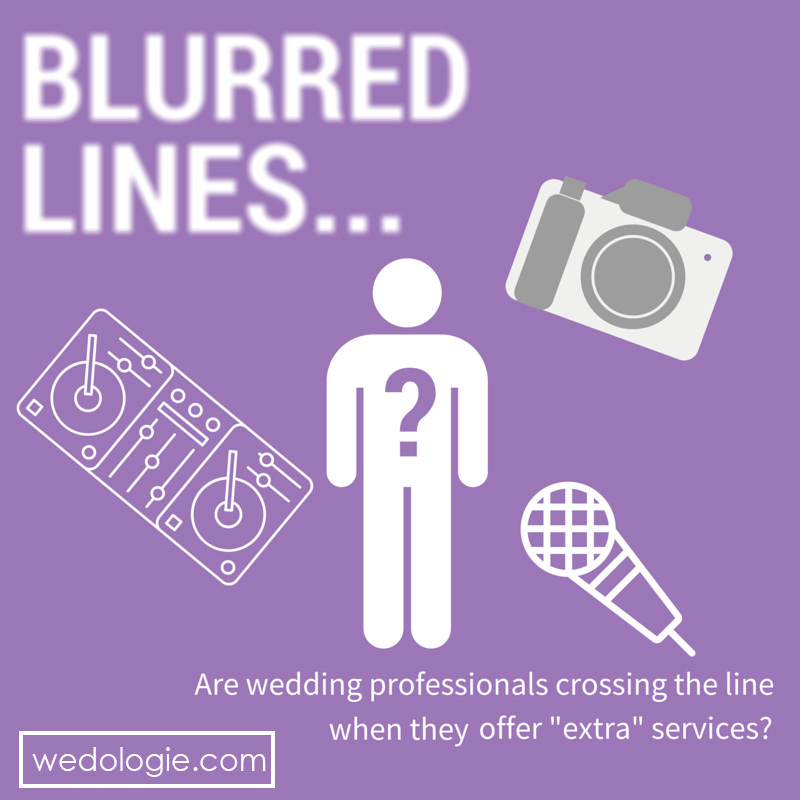 If a wedding “pro” starts over-stepping, providing conflicting and potentially damaging services that far exceed the scope of why they were hired – what choice does a photographer have?